The Flag of Pluto, designed by J. Alfary, represents the planet Pluto itself and its largest moon Charon. Blue represents the rocky and ice surface of Pluto and its extreme cold temperatures. The white sphere represents Pluto, while the blue-black crescent represents Charon. The black arrow pointing outward represents Pluto's and Charon's location on the edges of the Solar System. 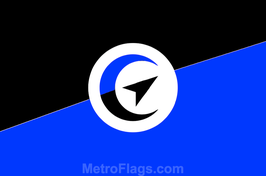 The dividing line between the black and blue sections of the flag represents the Kuiper Belt.